I have been wanting to do a project like this for a long time. Then the day came I was at an auction, wanted an antique windsor chair and the auctineer said, ” this next bid will be for these eight chairs”. UGH! However, I was the only one that wanted any of the chairs so they were packed like sardines into my car. This chair had no seat at all, just an open space where I am guessing there was once a rattan seat. Here are the instuctions and it was much easier than I had anticipated. I cut open a brown paper bag and put it on a table, turned the chair upside down on top of it to make a pattern. Cut out the seat pattern and used a jigsaw to cut out a piece of plywood. I glued and clamped the plywood onto the chair and let dry. Next using the same pattern, I used that as a template to guage the size of my belts. I cut them all about eight inches wider ( allowing enough to go underneath the seat on both sides) and weaved them making a square. 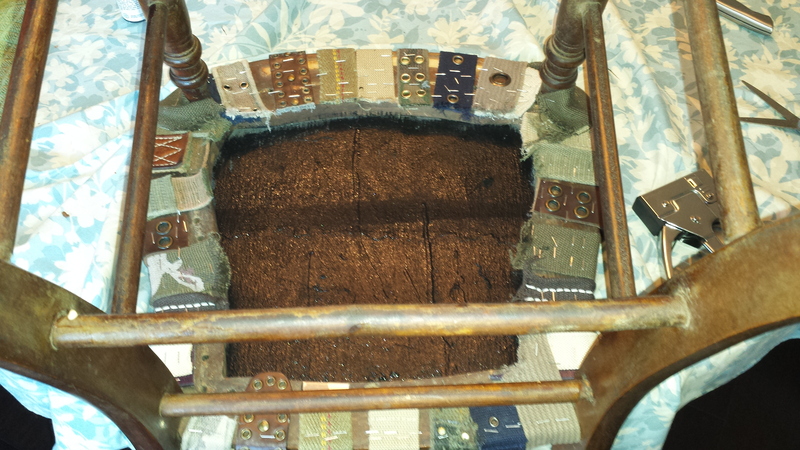 I glued the square of weaved belts onto the seat using wood glue and placed large heavy books on top. The ends of the belts at this time just hang around all sides of the chair. Once this was dry, I turned it upside down on another table and glued and clamped the belt ends underneath the seat. I only had eight clamps so I alternated the belt ends letting each dry. Once this was finished it was all glued firmly I stapled, stapled and then stapled some more. I used a kitchen steak knife, sharp tool to cut all of the edges nice and straight.